My name’s Jenny and I’m an ex-nail biter. It sounds dramatic but if you’re a nail biter you can probably relate. Nail biting really is addictive, as you’ll know if you’ve ever tried to stop! Bitter tasting nail polishes, snapping an elastic band on your wrist, getting false nails… You may well have tried all of this and more in an attempt to kick the habit, all to no avail! That’s why I devised my six-week nail and cuticle programme. Working together to get to the root of the problem, the totally bespoke programme will stop you biting for good and leave you with the gorgeous nails you’ve always dreamed of. Nail biting is a treatable condition called Onychophagia and is considered an impulse control disorder. Many nail biters pick up the habit during childhood and about half of all adolescents bite their nails. Most become so familiar with the constant chewing that they don’t even realise they’re doing it until it gets painful! Nail biting can range in severity from the occasional nervous nibble to biting and picking the skin around the nail until it bleeds and in extreme cases even removing the entire nail. It’s not surprising that this can have a negative impact on self-esteem and confidence. Biters tend to notice times when they ‘indulge’ more than others, particularly at times of stress, tension and anxiety and the biting can turn into a vicious cycle. It’s not just that nail biting doesn’t look attractive. It also has consequences for your health. Every time you bite, you’re transferring bacteria between your fingers and your mouth. Nasties like pinworms or bacteria buried underneath the nail find their way into your mouth and if swallowed can even cause stomach problems. Nail biting also leads to broken skin on the cuticles, leaving them open to microbial and viral infections such as paronychia. Saliva may then redden and infect the skin and biting hangnails can cause infections under the nail bed. Even worse, it can permanently damage nails, gums and teeth such as gingival injury and misalignment of the anterior teeth. Many nail biters reach a point in their lives where they are so sick of the embarrassment and pain of nail biting, they stop biting by sheer will power. Ultimately, it’s your own determination that allows you to finally stop biting your nails. In this way, nail biting is simply a bad habit. As with most bad habits it’s easier to break if you replace the habit with something positive and that’s why manicures are so effective: it took me years, but I finally learnt to care for my nails, instead of abusing them. The aim of my Nail Biting Programme is to support and re-educate you, so once you have achieved your goal, you can continue to have beautiful, strong, healthy nails. People who have bitten their nails are often embarrassed of their hands and do not see them as something to be proud of. Showing you how elegant and smart your nails can look, results in a great feeling of pride and decreases the desire to bite them once the programme has finished. You will have four appointments, beginning with an initial explanation of the programme and a full consultation where we will discuss your individual circumstances and set goals. This will then be followed by a further three appointments at fortnightly intervals. 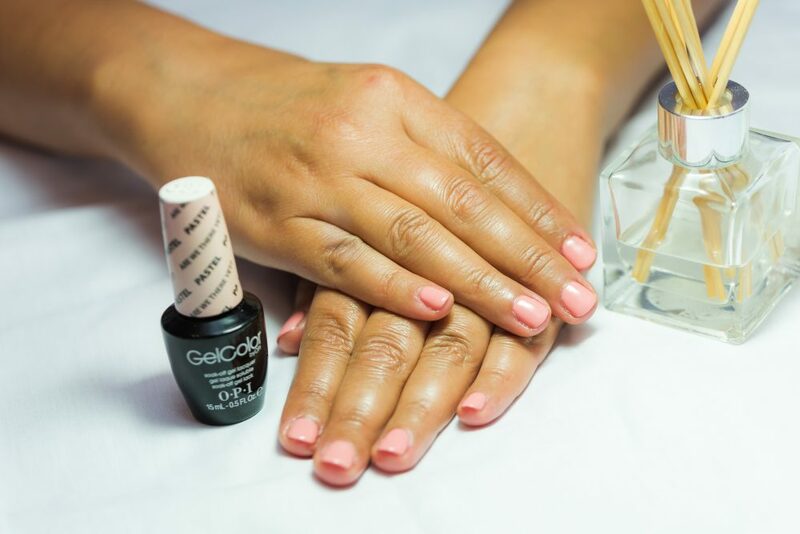 The programme includes a variety of treatments depending on individual circumstances, but usually consists of OPI Manicures, OPI GelColor Manicures**, Polygel overlays or extensions, nail exfoliation and nourishment or cuticle care hand treatments. OPI GelColor is an award winning gel polish which does not chip or wear like regular polish and dries immediately, so no smudges. Its scratch-resistant, high shine finish is practical, tough and durable, therefore making biting tricky! Nails are strengthened and enhanced with up to 14 days of gorgeous colour, protecting them with a strong top coat, allowing your own nails to grow. Once flimsy nails feel strong and unbreakable and as the weeks go by, their new length will motivate you to keep letting them grow. Cuticles will be tidied and treated to exfoliate, deeply hydrate and heal damaged skin, increasing suppleness and preventing hangnails. By the end of your very first appointment, your nails will feel so much better and will have a super smooth, mirror shine finish, along with snag-free moisturised cuticles. You will also receive a luxury OPI hand treatment at each appointment to smooth, deeply hydrate, refine and brighten your skin. At your final appointment, you’ll get an OPI Mini Manicure, a prescription clear OPI Nail Envy treatment or a gel manicure and you’ll go home with newly grown nails and lots of tips and advice on how to maintain them. Finally, you are provided with a homecare treatment package containing professional products to use in-between appointments. This is a very important part of the programme and you will be given full written aftercare advice, in addition to a demonstration of how to use your products and care for your nails and cuticles at home. As a professional nail technician, I regularly see people who have bitten their nails so badly the nails even look painful. Clients feel embarrassed and sometimes hopeless, believing that they will never have nice nails. Sadly, because nail biting is so common, it is easy to dismiss it as just a nasty habit instead of the nail disorder that it is. So an understanding of the condition is extremely important, as suitable care needs to be taken. Like a lot of people, I find that achieving goals are infinitely easier when done with others and when I began the process of kicking my nail biting habit, I did so with the support of friends and alongside one particular friend who was also trying to give up the habit. The simple fact of having another person with whom to share goals and achievements with allows you to succeed in your efforts to quit biting. My commitment to you is to be there with you all the way, to talk through any worries or concerns and to give you lots of encouragement and support. After all, a problem shared is a problem halved!! You can either pay it all in one go or in two more manageable instalments of £55. *The length of the programme is 6 weeks, but can depend on the individual as occasionally some clients take longer to resist temptation. Additional costs may apply. **Please see the manicure treatments section on the Fuchsia Beauty website for full details of each manicure.